Chengdu just barely edged out Beijing for highest PM2.5. I had to go out to two decimal places to find that difference. OK, so how bad is that exactly? Here’s that same graph with the World Health Organization’s health limits on top. It’s not pretty. Chengdu averages about three times the 24-hour limit of 25 micrograms. Bad days can easily go to 10 times that level. But really we should look at the annual limit of 10 micrograms because studies show that even levels below 25 micrograms are harmful to human health. On that standard, Chengdu averages seven times the safe limit. All right, I played a bit of a trick there. 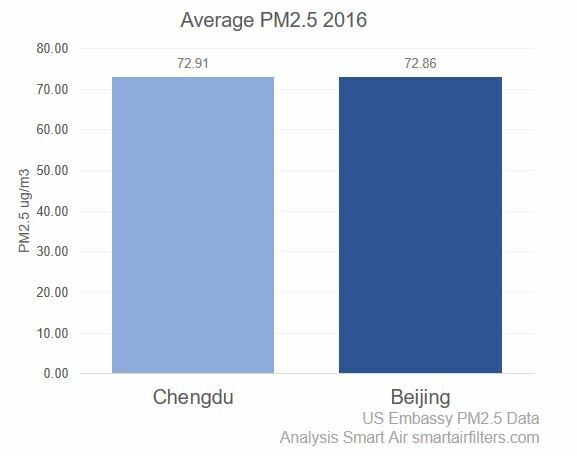 It’s a trick because Chengdu was just as bad in 2015. It’s just that Beijing’s PM2.5 came down, while Chengdu stayed the same. 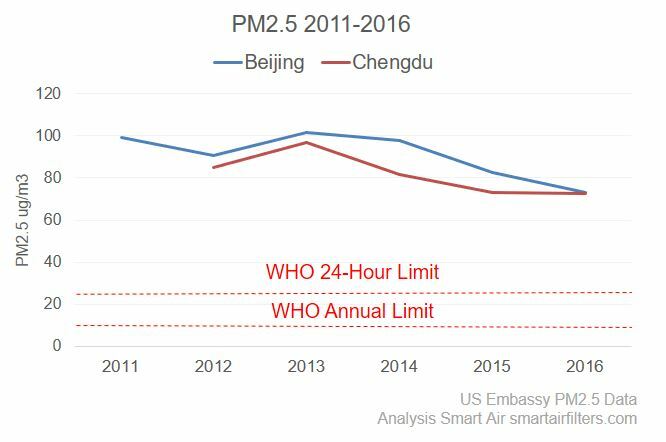 The data shows that Chengdu’s air pollution has been dangerous for at least four years (probably a lot longer), but awareness has just started catching up recently—particularly in 2016. 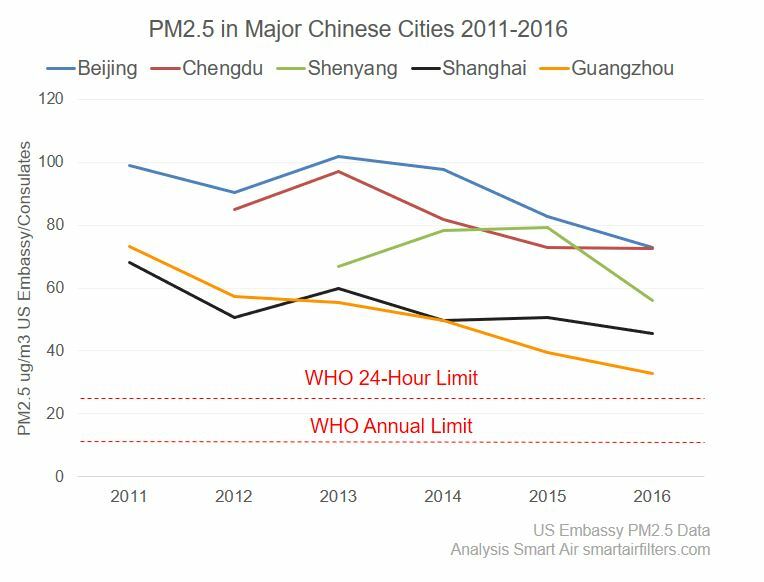 I analyzed PM2.5 data from all of the US Embassies and Consulates across China. That data shows Chengdu and Beijing are at the top of the pollution rankings. PM2.5 has been coming down, but no major Chinese city has safe air. 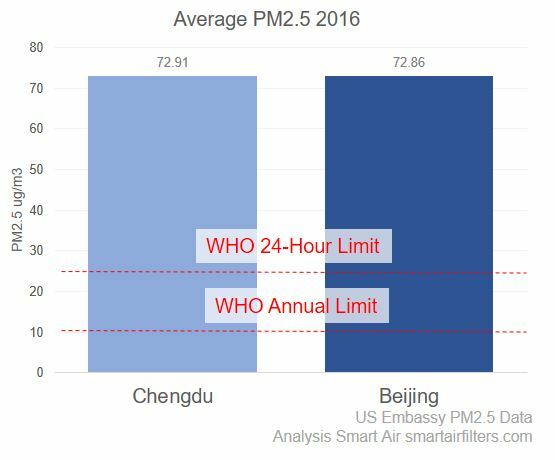 So if you’re in Chengdu, Beijing, or elsewhere, protect your lungs!